Are you into adventurous online slots? Then you should certainly visit Royal Panda to play their new set of games from the popular Genesis Gaming stable. Spin the reels of face-melting slots, such as Machine-Gun Unicorn, Carnival Royale and Disco Night Fright. Needless to say that these smashing additions come with exciting themes and lots of bonus modes. Machine-Gun Unicorn is one of those appealing video slots that are difficult to resist. Enjoy the fast-paced game-play whilst fighting against zombies, who invade Unicornland. Take home the top prize worth nearly 93 lakh rupees and meet ponies armed with bats and dragons. If the golden unicorn appears on the third reel, it will use its machine gun to blow away zombie heads. The future of Unicornland is in your hands! 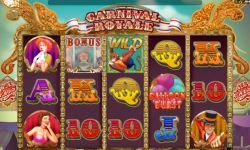 Gamblers with a weak spot for circuses should definitely try the new Carnival Royale online slot. This freewheeling game features a 45 lakh rupees top prize, alongside 243 ways to win. On the five reels you will find clowns, magicians, gorgeous women, balloons, and many more. Take advantage from the Balloon Burst feature, multipliers, and Carnival Attraction free spins. Carnival Royale represents colorful graphics and a circusy audio experience. Ready to play a groovy online slot game with a disco/ Halloween theme? Start spinning the reels of the Disco Night Fright slot and scoop the 65 lakh rupees top prize. Enjoy a remarkable mix of werewolves and disco, alongside stunning visuals. Collect three or more scatter symbols to activate the werewolf free spin mode. In addition to 10 free spins, all disco dancer logos convert into disco werewolves. Head to Royal Panda and try the new Genesis-powered slots!